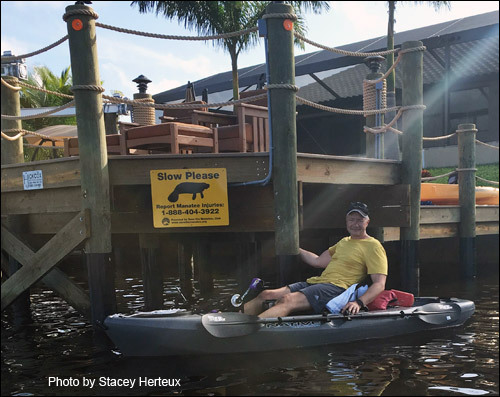 Rene Herteux (in photo) from Lee County, Florida, and his wife Stacey, requested Save the Manatee Club’s dock sign to remind boaters traveling through their canal to slow down because manatees frequent the area. “As nature lovers, it is important to us to try and find a balance so that wildlife and people can live together in the same space,” said Stacey. Note: Note: A high resolution jpeg (300 dpi) of a manatee image, as well as a photo of the Club’s posted dock sign, are available upon request. Florida’s boating community is gearing up for a long, busy 4th of July weekend. Save the Manatee Club urges resident boaters and visitors to be extra vigilant on the waterways and help keep the official state marine mammal, our manatees, safe. So far in 2016, manatee watercraft-related deaths are outpacing the previous record year, which was 2009. Southwest: In January, a female manatee was reported in the Orange River in Lee County suffering impact injuries from a watercraft strike including fractured ribs and vertebrae and torn and collapsed lungs. Her condition left her unable to eat. She may have survived up to several weeks after being struck before dying from her injuries. Northeast: In early May, an injured manatee was reported off the Intracoastal Waterway in Port Orange, Volusia County. The manatee had acute wounds from a propeller injury that caused fractured ribs and penetrated all the way into one of the lungs, tearing it and causing the lung to protrude from his body. The manatee died from his severe injuries before a rescue was possible. Southeast: In early January, a female manatee, killed by acute impact wounds inflicted by a watercraft, was recovered from Florida Bay in Tavernier, Monroe County. At the necropsy (animal autopsy), the female was found to have drowned after the strike. It was also discovered that she had been pregnant with female twins, which is a rare occurrence. The unborn calves also died. Northwest: A male manatee was found in the Chassahowitzka River in Homosassa in March suffering from multiple watercraft strikes, one of which was to the head. The manatee was found alive and was supported in the water by caring boaters until rescuers could arrive. He died after two days in rehabilitation due to the severity of his injuries, which included brain hemorrhage. “We implore the boating public to be on the alert for manatees because vessel operators are the only ones who can prevent manatees from strikes that often lead to serious injury or death,” explains Tripp. Save the Manatee Club works to safeguard manatees from watercraft collisions by producing and distributing public awareness and educational materials free to boaters, shoreline property owners, and to the general public. Florida boaters carry the Club’s “Please Slow Manatees Below” waterproof banners to warn other boaters that manatees are in the area. The Club’s boat console stickers and shoreline property signs both feature the Florida Fish and Wildlife Conservation Commission’s (FWC) hotline number to facilitate the rescue of an injured or orphaned manatee, or to report harassment. Call the FWC at 1-888-404-FWCC (3922) or #FWC or *FWC on a cellular phone, or use VHF Channel 16 on a marine radio, or text or email to Tip@MyFWC.com. The Club has also produced a new video titled Manatees and Watercraft, which focuses on the problems manatees face in the water every day. The Club encourages the public to watch the video, which includes interviews with manatee experts as well as rescue and rehabilitation personnel and includes actual stories of manatees injured by watercraft. More Manatee Protection Tips for Boaters can be found on the Club’s website at savethemanatee.org/boatertips. Also download the free Manatee Alert App for iPhones and iPads at iTunes, which notifies boaters when they are approaching manatee speed zones and helps facilitate the reporting of injured manatees and manatee harassment. The free public awareness materials listed can be obtained by contacting Save the Manatee Club via e-mail at education@savethemanatee.org or by calling toll free at 1-800-432-JOIN (5646).